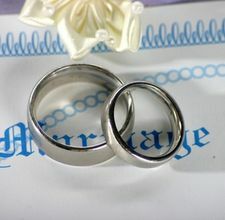 Posted on September 24, 2011 | Comments Off on Wedding Insurance. On your wedding day the last thing you want to think about is a sudden disaster , but it happens. In the event that you have any type of disaster on your big day you can assure that you’re covered by securing wedding insurance. 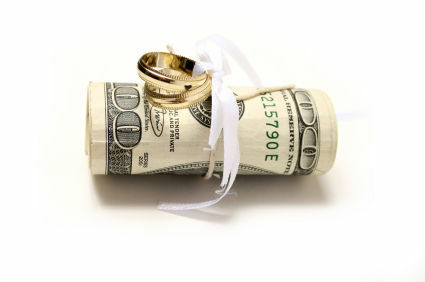 Wedding insurance protects a couples investment from things beyond their control and reimburses them for their expenses. For example, What if the limo driver doesn’t show up the morning of your wedding and you have to book another company at an inflated price right away? Or what happens if the reception hall you booked went bankrupt weeks before your big day and your not able to get back your deposit back? 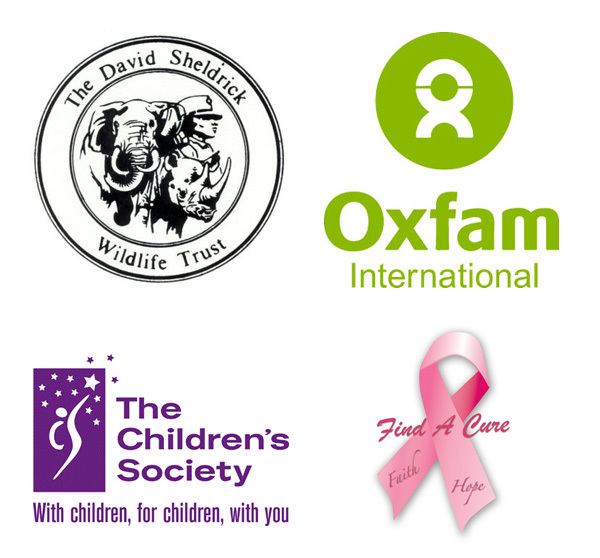 These are things that your insurance will help you take care of. Wedding Insurance also takes care of more tragic events like your dress catching on fire, the loss of your wedding bands, and even the costs of having to postpone your wedding all together for events you couldn’t control. 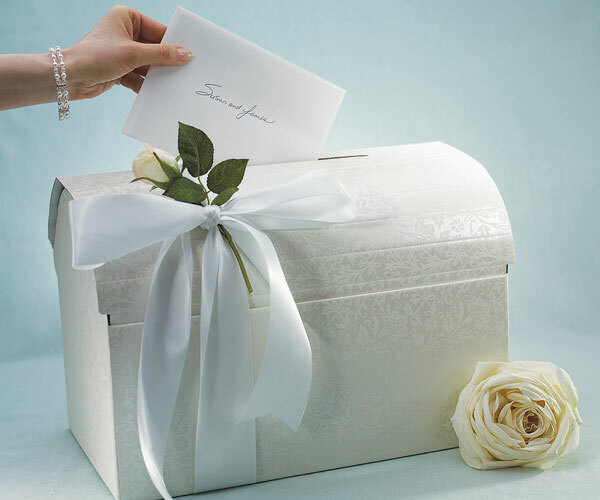 Wedding insurance However, does not cover a change of heart , watches , jewelry (outside of your bands) or semi-precious gemstones, and your engagement ring. 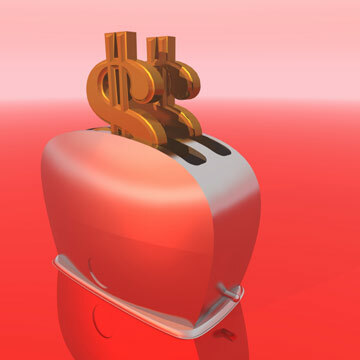 A basic policy that covers loss of photos , videos, attire, presents, rings, and deposits usually costs anywhere between $155-$550, depending on the amount of coverage you want. General liability insurance , which covers up to 1million dollars for accidents, costs around $185.However, before you buy wedding insurance , check with each of your vendors because they may have an insurance policy of their own in the event that they can’t deliver their services. Do not wait up until the last minute to insure your wedding because their may be certain time restrictions on any given policy or claim. 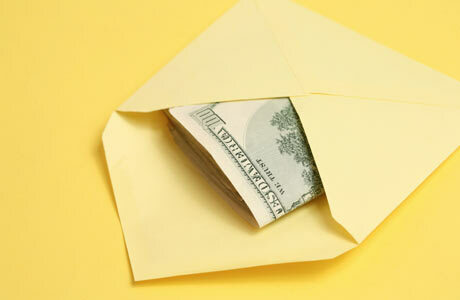 In all , wedding insurance is great to have, even if you never have to use it. 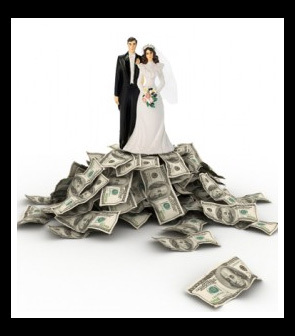 Comments Off on Wedding Insurance. Jewish wedding are full of traditions and a beauty, If you’ve never been to one but were invited to one recently , there’s a few things you should expect. However, if you’re looking to incorporate a portion of Jewish traditions into your wedding here’s some of the most important elements of a jewish wedding. 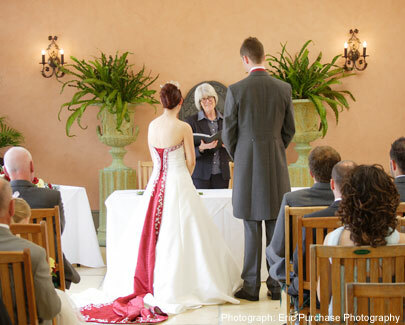 Unlike the christian wedding , both the bride and groom walk down the aisle with both parents. Traditionally, the rabbi walks out first, followed by the groom and his parents, the grandparents, the groomsmen, the bridesmaids, the flower girl and ring bearer, and the bride and her parents. However, this specific order is not always followed. In some wedding the bride and her parents circle the chupah seven times, there are several different religious reasons why this occurs. 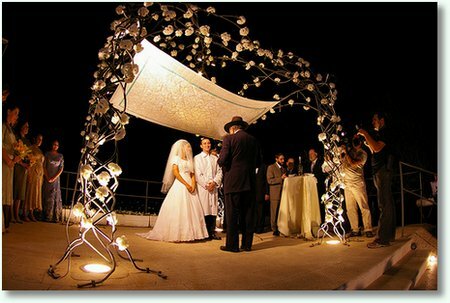 The wedding ceremony takes place under the chupah, which is a canopy on four poles that is sometimes decorated. The chupah symbolizes that the bride and groom are creating a home together and that it will always be open to guests. 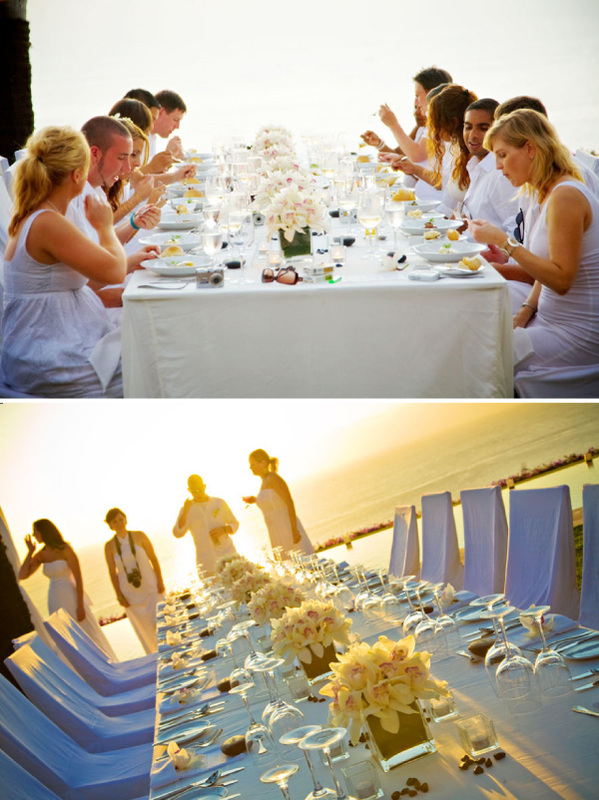 This tradition originates from the Biblical wedding of Abraham and Sarah. 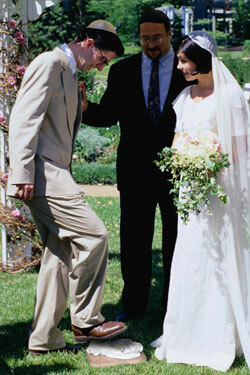 Traditional Jewish wedding ceremonies have two parts. During the first part, the bride and groom become betrothed and a blessing is recited over a cup of wine that the bride and groom drink. Traditionally, the groom puts a ring on the bride at this point, although this has become mutual at many modern weddings. Later, the Sheva Brachot, or seven blessings, are recited over another glass of wine. Relatives and close friends are sometimes asked to recite this blessing to honor them. 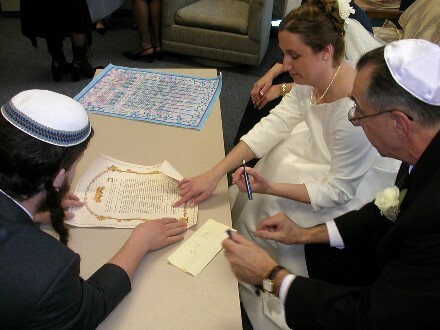 The ketubah is a Jewish wedding contract. The rabbi reads it under the chupah after the ring ceremony. Many couples frame their ketubah and display it in their home. Traditionally, the ketubah was written in Aramaic, but today many Jews use Hebrew instead. At the conclusion of the ceremony, the groom smashes a glass with his foot. The meaning of this act is disputed, one interpretation is that the marriage will last as long as the glass is broken– forever.After the breaking of the glass, the guests yell, “Mazel Tov!” which means good luck. 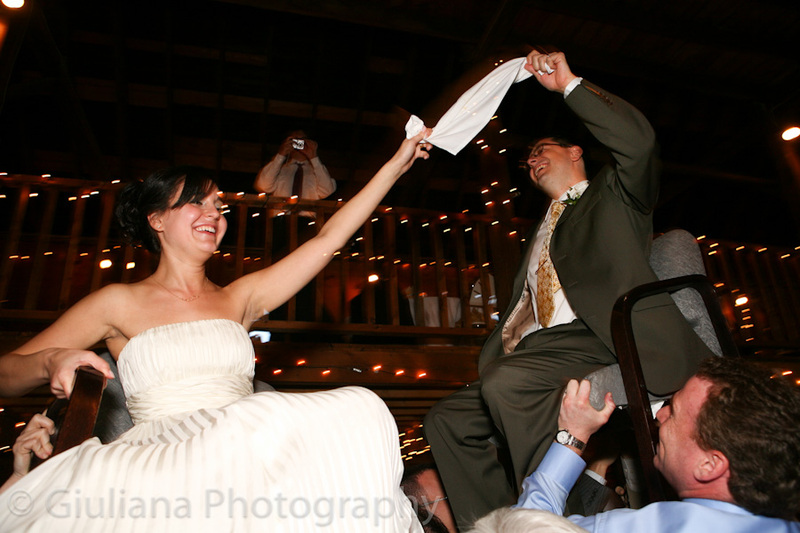 No Jewish wedding is complete without the Hora, or chair dance, most likely derived from the tradition of carrying royalty on chairs. A few strong guests hoist the bride and groom high above the crowd on chairs to the song “Hava Nagila”. Friends and family dance around in a circle as the couple tries not to look down. 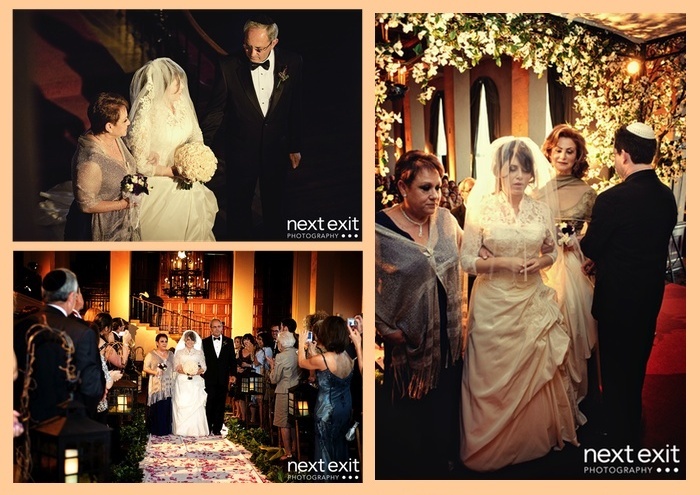 The Jewish wedding is surrounded in a great deal of tradition which is rare in many modern-day weddings. If you are planning to incorporate these traditions into your own wedding or if you were curious as to how these traditions were carried out, you now know a little bit more about the Traditional Jewish wedding. Posted on September 6, 2011 | Comments Off on Table Settings! It goes without saying that every wedding will require different types of table decor. 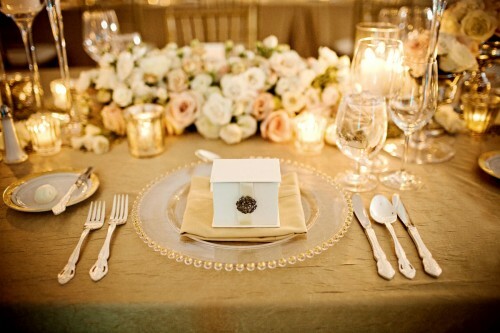 Though table settings are very formal it is ok if you do not go entirely formal with your settings. A modern but casual feel has been popular within the last few years, therefore you will not be odd if you decide to dress a stiff setting down. Though you may see the setting up of a table to be rather complicated , it really isn’t they are designed to help people eat with ease, not confuse them. For a basic dinner , each place should include a dinner plate, glasses and/or goblets (depending on your drinks), and flatware such as spoons, forks and knives. More formal settings would include salad forks, soup spoons and butter knives. Place all the utensils on either side of the plate from the outside going in, in the order that they will be used. That way, even if guests aren’t familiar with the setting, they’ll know instinctively which ones to reach for. 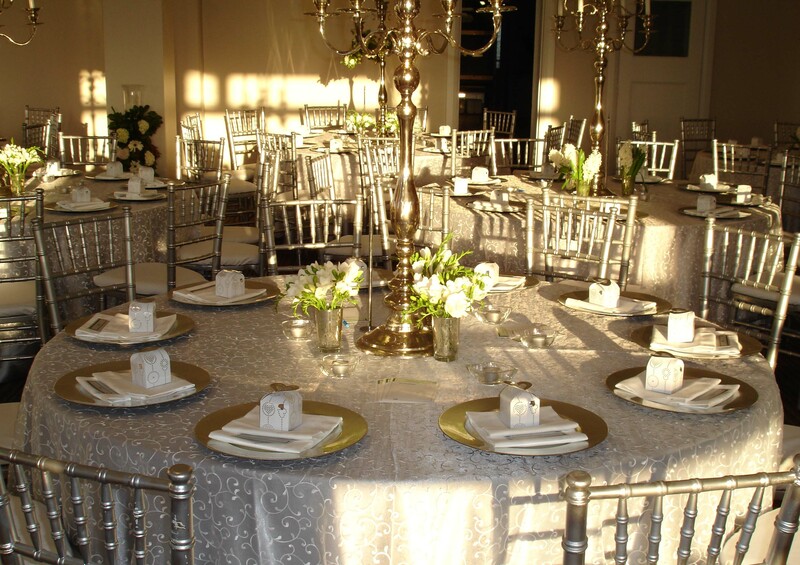 Though you would like your tables to fit perfectly into your theme it is great for them to also add something to the overall decor. After all, your guests will be looking at the tables for the rest of the night, it’d be nice for them to find something new each time.You can add a few fresh flowers in a different color then your basic color scheme or in different shades of a color your using. 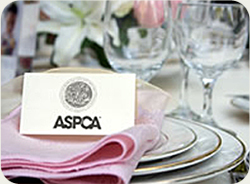 You can also find ways to add little pops of color with the napkin holders or the trimming of your menus. Adding a touch of romance and creativity to your table settings can do nothing but multiply the love and beauty in the room. The soft glow from candle light always makes you and the room you’re in feel romantic, use candles that match your color scheme to add to your tables. 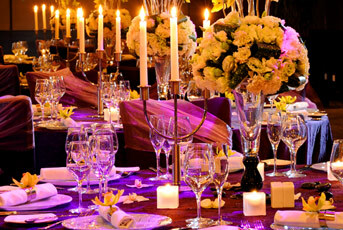 The candles will work best for your decor if the lights are low and the candle glow can dominate. Being creative when it comes to your table settings is always a great thing, you will never see any two table settings that are exactly alike and this is due to the many different and creative ways your table can be used. Take a look at a few galleries to decide what looks you like the best and how you will utilize the different elements to design the table of your dreams. Comments Off on Table Settings! 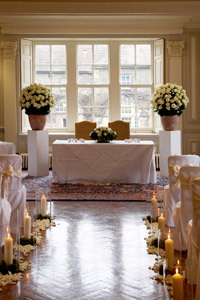 Planning your wedding is always difficult when your changing seasons because you have to think ahead to the next season. 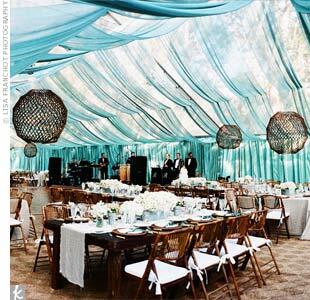 The many elements of your wedding must in some way tie into the current season. Now that fall is approaching it’s time to consider what you can do to incorporate the 2011 fall trends. Higher hems are big for the fall season , because of the higher dress hems you need to make sure you have the perfect shoes. The perfect shoes for everyone is of course very different and may be that perfect high-end designer shoe or a shoe that simply match your color scheme. 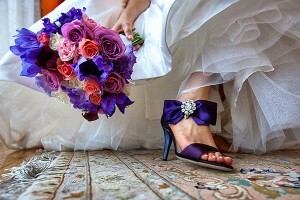 In order to match the higher hem of your dress, you should pair it with a shorter veil. What type of short veil you will use is solely up to you, just make sure that it compliments your dress perfectly. Sheer layers are also a great trend for the fall. You can incorporate these sheer layers into your wedding through your invitations and other wedding stationary. You can also incorporate the sheer layers into your wedding decor by adding “clear” chairs and accents, Sheer fabrics and linens, crystals and beaded bouquets, and even transparent tents draped in sheer fabric. Texture is also a popular fall trend,it is something that we’re around everyday, so finding ways to incorporate touches of texture into your wedding is fairly simple. 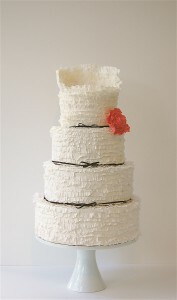 Choosing a cake that matches the texture of your dress is a very easy way to incorporate texture. There are plenty of other ways to add texture to your wedding if you’re not too interested in the idea of a textured cake. Adding textured stationary, linens, flowers and branches, and paper accessories are a great way to add texture to any ceremony. 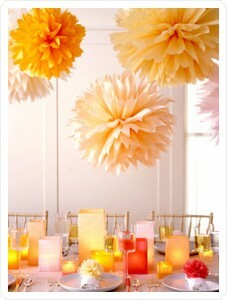 In order to assure that your wedding is chic for the fall you can add some or all these elements. However, too much of anything is never good.